From the Planes You’ve (Probably) Never Heard Of Department of Wingspan, we bring you the Short Sperrin. Though the turbojet engine predates the Second World War, it wasn’t until spring of 1944 that it started to be used operationally. By the end of the war, it was clear that the jet engine was the powerplant of the future, but aircraft designs that could make full use of the speed provided by the engines had yet to arrive. In England, the so-called V bombers—the swept wing Vickers Valiant and Handley Page Victor, and the delta wing Avro Vulcan—were in development, but the RAF decided to hedge their bets on the new bombers by using the fallback position of a more traditional bomber, one that had straight wings and hearkened back more to the piston-powered bombers of WWII rather than looked forward to the jet age. That “just in case” bomber was the Short Sperrin. Short Brothers, or Shorts as they were commonly known, is not a well known name to the casual aircraft enthusiast. Founded in 1908 in Battersea near London, Shorts eventually set up their headquarters in Belfast, Northern Ireland in 1936. They are credited with building the first aircraft to be produced in numbers and the world’s first successful twin-engine aircraft, the Triple Twin. By the 1930s, Shorts began to make a name for themselves with the production of flying boats, and produced the RAF’s first four-engine bomber, the Short Stirling, which was also the largest bomber flown by the RAF in WWII. In the 1950s, Shorts continued to do pioneering work in aircraft design, and produced radical aircraft that pushed the bounds of aircraft design. In 1947, the Air Ministry published requirements for a modern bomber to replace the Avro Lincoln, the standard British piston-powered bomber of the early postwar period. But the requirements for the new bomber were ambitious, and the Ministry feared that the specifications might not be met in time. Shorts had been one of four companies to respond to an earlier specification, B.14/46, which called for a four-engine medium jet bomber, and theirs was selected as the fallback design should the advanced aircraft suffer delays. Though the Sperrin (named for the Sperrin Mountains in Northern Ireland) was of a very traditional design, it did employ some novel features, most notably its engine placement. 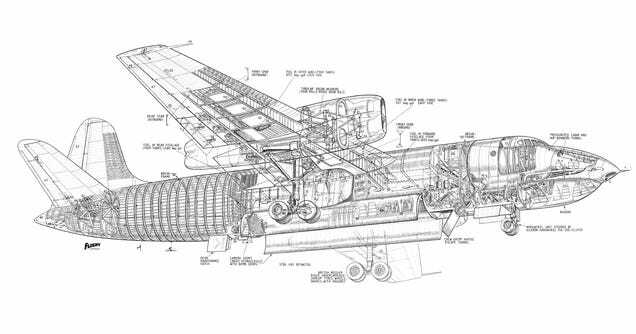 At a time when most large British jet aircraft housed their engines in the wing roots, Shorts placed the Sperrin’s four engines in the middle of the wing, one on top of the other. Also, the pilot had no direct control of the aircraft’s control surfaces. Control inputs were passed to a gearbox that moved the surfaces via jack screws. The first of two prototypes was powered by the first production Rolls-Royce Avon turbojet engines and took its maiden flight on August 10, 1951. But with the development of the Vickers Valiant progressing successfully, the Air Ministry threw its weight—and money—behind the Valiant, and chose not to produce the Sperrin. Construction of a second prototype was completed, and while the Sperrin never fulfilled its role as a bomber, it did become an important research aircraft, where it performed critical work into the development of emerging powerplant and weaponry technologies. The Sperrin served as a testbed for experimental engines such as the de Havilland Gyron turbojet, and took part in the testing of the Blue Danube nuclear bomb and the Blue Boar television-guided glider bomb. However, despite its usefulness as a testbed, more modern aircraft were waiting in the wings, aircraft that employed swept and delta wings and more advanced avionics, and both Sperrins were scrapped by the late 1950s. The Sperrin being flown at the Farnborough Airshow with a single de Havilland Gyron engine mounted in the lower left nacelle. Short Sperrin with a Short Seamew ASW aircraft following close behind.